Reviews: Stanley at School & Starring Shapes! Source: Digital galley courtesy of Kids Can Press via NetGalley. Thank you! Stanley knows school is for kids, not dogs. But every day he grows more and more curious. What did the kids do in that school all day? Stanley rounds up his pals from the dog park to take a closer look. Will they find the answers they’re looking for? One thing is for certain: School + Stanley = TROUBLE! 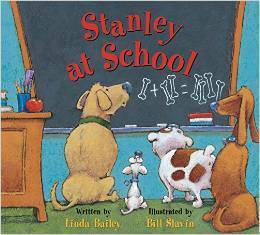 I have read and enjoyed a few previously published Stanley titles and was looking forward to reading Linda Bailey and Bill Slavin’s latest Stanley collaboration, Stanley at School. As familiar and comforting as it is to read another (mis)adventure that Stanley and his dog friends embark on, the story in this tale did not delight or tickle me as much as previous ones. I personally found that the story itself read, for various reasons, as slightly stilted- lacking a fluid pace. This could be due to the fact that the dialogue between the dogs (not necessarily the narration or story arc) read as bit uneven. Stanley and his friends Gassy Jack, Nutsy and Alice are supremely cute and curious, but the dialogue between them reads as forced (like the author was trying too hard to give them each a distinct voice through limited space and text). Readers who have enjoyed previous Stanley titles will likely flock to this one- and have fun reading all about the latest escapades. Slavin’s illustrations for this Stanley title are, as ever, joyful and fun, and I could not imagine these stories without his particular palette and warm illustrative style. For readers new to Stanley, however, I would recommend starting off with Stanley’s Party or Stanley’s Little Sister. I received this book as a digital galley from Kids Can Press via NetGalley in exchange for an honest review. Shapes play supporting roles in the world around us, but which one will be the star of Shapeston Elementary School’s play? Triangle has experience as a traffic sign, and Square moonlights as a postage stamp, Circle as a lemon slice, Rectangle as the cover of a magazine and Diamond as a kite, while Oval has played a surfboard. A fun and fresh look at basic shapes that will have you seeing them in surprising places. Starring Shapes! written and illustrated by Tania Howells, is a darling picture book. 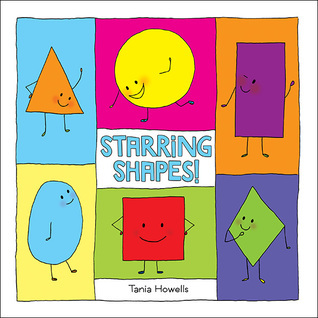 Children’s books about shapes and explaining shapes have been done many times over but Howells’ work offers additional charming elements to the mix. In a way that reminds me of the crayons’ letters in Drew Daywalt’s and Oliver Jeffers’ The Day the Crayons Quit, readers here are introduced to each of the main shapes one by one. We’re given their descriptions, their likes, and how they are often used and seen in drawings. For example, Rhombus- known as Diamond more informally- can be found in argyle socks and can fly high in the sky being a kite. Corresponding to each shape’s ‘biographical’ page, there is a page of drawings which visually illustrate how each shape can magically transform, become or create objects. The running story to this picture book is that the shapes, along with the boys and girls at Shapeston Elementary School are excited and slightly nervous about auditioning for the school play. But the shapes and children do not need to worry, for everyone gets a part! This is another happy element to the picture book; demonstrating that everyone is a star (to borrow from the book), and everyone has something important to offer. Is this a tiny bit heavy-handed to emphasize a lesson? Perhaps, but it doesn’t come across as insincere or hollow here. Overall, Starring Shapes! is, simply put, a sweet read. The clean lines, child-friendly illustrations and primary colour palette will likely appeal to younger readers, though the pages of longer text may require some reading help. Readers who enjoy the picture books of Lois Ehlert, Anne Rockwell, Michael Hall, Antoinette Portis, Annette Simon, or Anthony Browne might especially enjoy this title.